Wood and multi-fuel central heating cooker. • Large Central heating ability, up to 20 radiators. • Lashings of domestic hot water. • Excellent cooking facilities both on the hot plate and in the ovens. 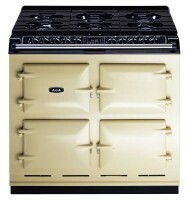 • Enhances the charm and feel of a country kitchen with a mixture of colours and cast iron. • Bosky has been used to heat UK homes for the last 25 years providing both reliability and economy. Please note we only import the standard boilers so please specify if you want vitrified boiler or not.